Here we are again chasing the "Top Chef". We love the show and yes, it is becoming clear on this trip that we were doing just that. 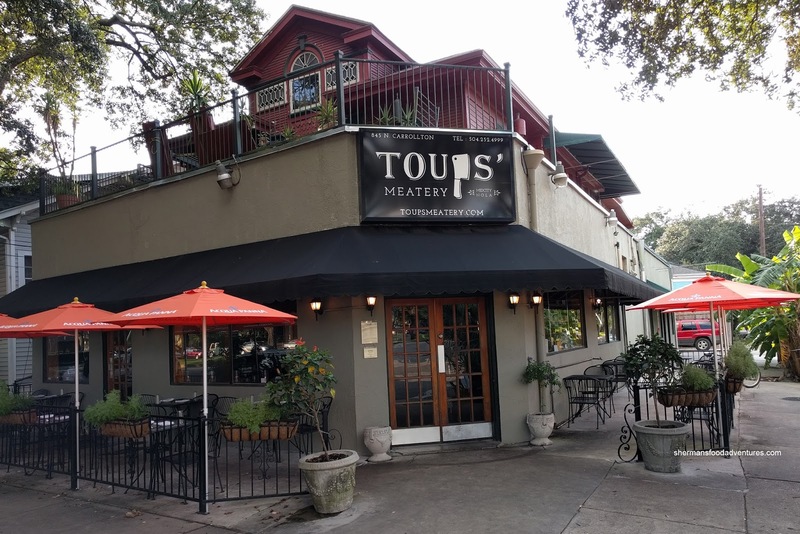 Although Executive Issac Toups did not win his season of Top Chef, we were impressed with his meat-focused culinary direction. Let's be honest here too, talented chefs such as him are often behind the 8 ball on a show like Top Chef. His type of no-excuses big and bold cooking often takes a back seat to the delicate cookery required to win. Well, we already did that with a visit to Restaurant August. 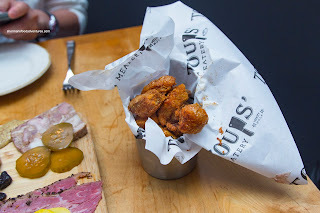 This time, it was all about the meat and honest food at Toup's Meatery. 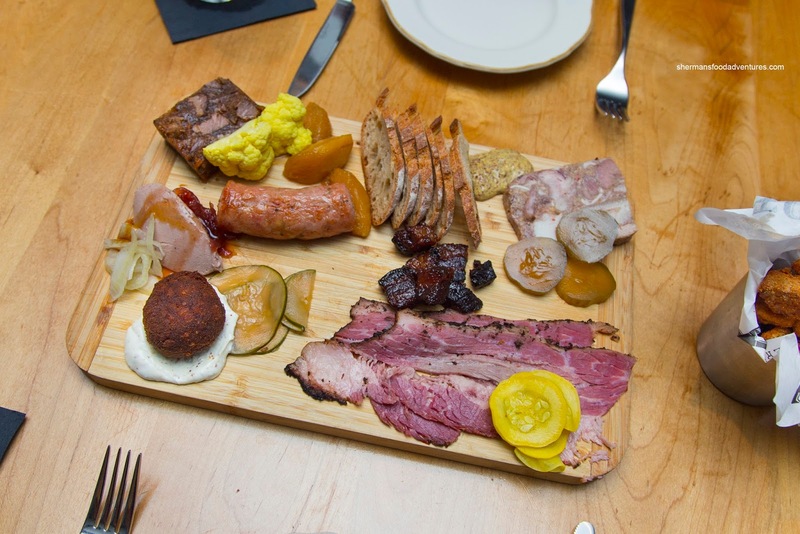 Of all things on the menu, the one thing we had to get was the Meatery Board for a reasonable price of $25. My favourite item was something served on the side being the Cracklings. They were crunchy, aromatic, well-salted and sinful. These should be sold as a snack to go! On the board, the Boudin Ball as it was firmly crispy with a spicy and meaty filling that was also quite smooth. The Chicken Liver Mousse was on point being silky and creamy with an appealing sweetness spiked with brandy. I found the Chicken & Pork Sausage to be meaty and juicy with nice hits of lemon and rosemary. I wasn't a huge fan of the Pastrami as it was chewy. It was appealingly peppery and salty though. On the other hand, the Rillons (candied cracklings) were addictive being sweet with a great mouth feel. The Hog Head Head Cheese was buttery and fatty with a porky gaminess. Lastly, the Daube Glacé was salty and meaty with some tang from the gelee. 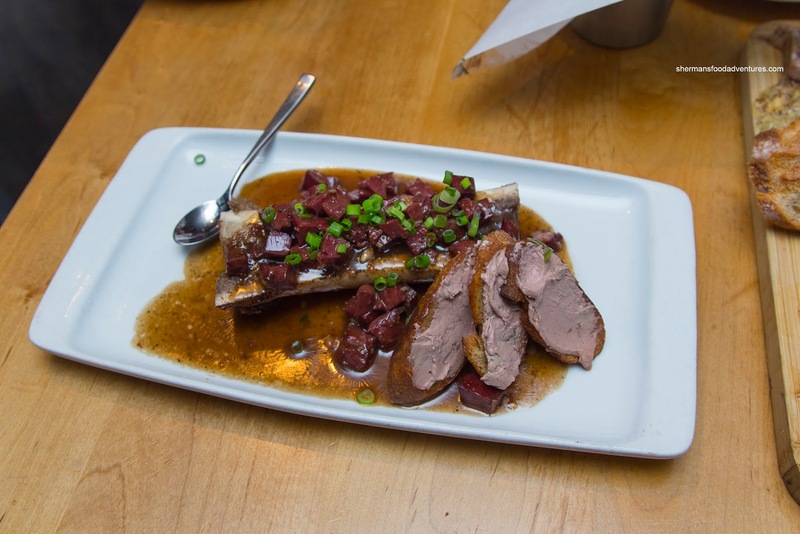 For some inexplicable reason, Viv wanted to try the Bone Marrow with confit beef heart and chicken liver mousse despite already sharing the meatery board. As if we needed this meal to get any heavier and decadent! Predictably, the dish was rich and sinful. Featuring a large bone with plenty of fatty and creamy marrow, it was topped with a silky and gelatinous sauce. We felt the marrow was oversalted though. Meaty and tender, the beef heart was not gamy at all. On the side, we found crostinis topped with the same delicious and smooth chicken liver mousse as found on the board. With the food we had so far, we could only add one entree, but what an entree it was. 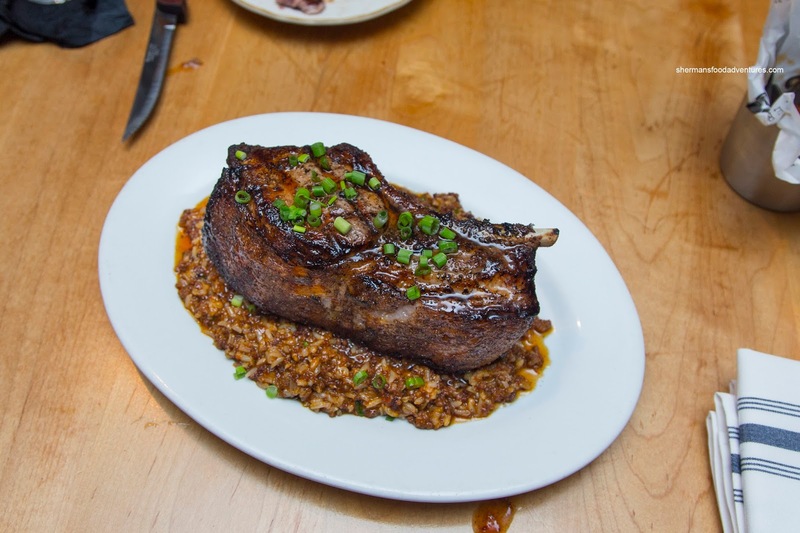 We selected the Double-Cut Pork Chop atop dirty rice and served with a cane syrup gastrique. Oh wow, this was awesome! The huge pork chop was brined expertly where it was juicy and succulent while cooked perfectly. It wasn't salty though, which allowed us to taste both the pork and the gastrique. We liked how the meat was nicely charred on the outside which added nice visuals and smoky caramelization. The dirty rice was also delicious with the saltiness balanced by the gastrique. As you can see, the food at Toup's is not light by any stretch of the imagination. However, this brash, no-excuses cooking is what makes it a must-try in NOLA.